Thanks to the Swiss Indoors Business Club! The Business Club brings together members from among the sponsors as well as from the tournament’s political and cultural circles. It looks set to rapidly enhance its reputation as being the leading networking event in Swiss sport. Each year, the net proceeds from the events are donated to a different charitable institution. 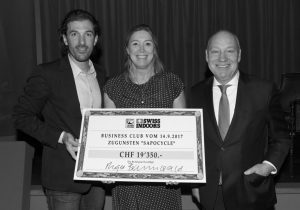 This year, SapoCycle was the lucky one benefiting from the Swiss Indoors Business Club generosity and received nearly 20’000 CHF as a donation. The donation check was handed over on Thursday, September 14th. Photo (left to right): Fabian Cancellara, 2017 guest and famous Swiss former professional road bicycle racer, with Dorothée Schiesser, founder of SapoCycle and Roger Brennwald, President of the Swiss Indoors tournament.